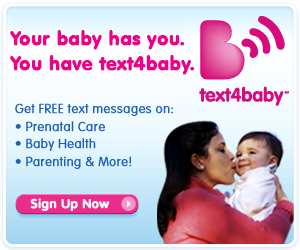 Text4baby is a free mobile information service designed to promote maternal and child health. An educational program of the National Healthy Mothers, Healthy Babies Coalition (HMHB), text4baby provides pregnant women and new moms with information they need to take care of their health and give their babies the best possible start in life. 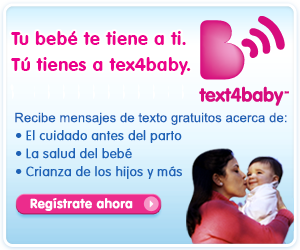 Women who sign up for the service by texting BABY (or BEBE for Spanish) to 511411 will receive free SMS text messages each week, timed to their due date or baby’s date of birth. Registration is easy and can be done online at www.text4baby.org or from your cell phone. Simply text the word BABY (or BEBE for Spanish) to 511411. You’ll be asked to enter your baby’s due date or your baby’s birthday and your zip code. Once you are registered you will start receiving free messages with tips for your pregnancy and caring for your baby. These messages are timed to your due date or your baby’s birth date. If your due date changes, you can text UPDATE to 511411 and enter your new due date. If you want to stop receiving messages from Text4baby, you can text STOP to 511411. If you want to start the messages again, you will have to re-register by sending BABY to 511411 (BEBE to 511411 for Spanish messages).